A few weeks ago I made some fabulous chicken wings. They were crispy and delicious on the outside and tender on the inside. And, guess what? They weren’t fried! That’s right, they were baked in the oven. The secret is to parboil the wings which will cook off some of the fat. When they bake, they don’t have a bunch of grease keeping them from forming that nice crispy crust. 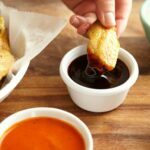 You really must try this chicken wing recipe, whether you eat them plain or with the dipping sauces mentioned, I know you are going to love them. Below is a printable version of this recipe along with 5 dipping sauces. Enjoy! Cut off the wing tips and use knife to separate wings at the joint. The wing tip does not have enough meat to eat, but can be saved to use in making chicken stock. Bring a large pot of water to a boil and drop the wings in, par-boiling them for 6-7 minutes. This helps cook away some of the fat, making for a crispier baked chicken wing. Remove the wings to a cooling rack and allow them to dry. Preheat the oven to 450 F. Spray a rimmed baking sheet with cooking spray. In a small bowl, mix together the salt, pepper and garlic powder. If needed, pat wings dry with paper towels. Season wings with the salt mixture and place on baking sheet. Bake for 40 minutes, turning once halfway through cooking. 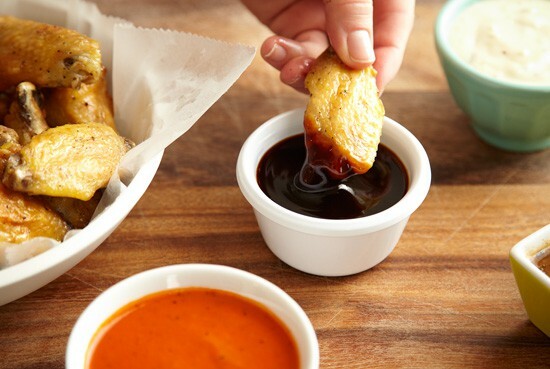 Serve your wings as is with dipping sauces on the side, or toss with your favorite sauce to coat the wings right after they come out of the oven. Buffalo - Combine a 12-ounce bottle of your favorite hot sauce, 1 stick of butter, 2 teaspoons of honey and a pinch or two of garlic powder in a bowl. Whisk together until well combined. Bleu Cheese - In the bowl of a food processor combine 1-cup sour cream, 1/2-cup heavy cream, 16 ounces crumbled bleu cheese, 2 teaspoons hot red pepper sauce, 1 teaspoon Worcestershire and 1-teaspoon salt. Process all ingredients until smooth. Chili Lime - In the bowl of a food processor, combine 2 tablespoons of chopped jalapeno pepper, 1-tablespoon chili sauce, 1/2-cup limejuice, 1/3-cup chicken broth, 2 cloves of garlic, 1 teaspoon of sugar, 2 tablespoons fresh chopped cilantro, and 1/4 teaspoon of salt. Process until smooth then heat in a saucepan and allow mixture to cool. 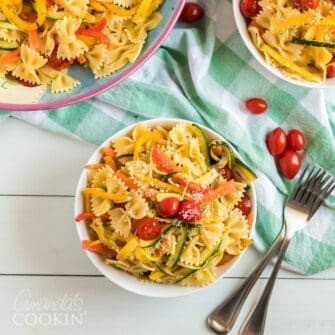 4 teaspoons canola oil, 1/2 cup sherry wine, 1/2 cup soy sauce, 2 tablespoons of toasted sesame seeds, 1/4 cup packed brown sugar, and 1/4 teaspoon red pepper flakes. Heat sauce over medium heat. In a small bowl, slowly add 1/4-cup water to 4 teaspoons cornstarch until well combined. Add cornstarch mixture to the sauce and stir until thickened. Curry - In a blender or food processor, combine 2/3 cup plain Greek Yogurt, 1/4 cup mayonnaise, 1 teaspoon each lemon and lime juice, 1 1/2 teaspoons curry powder, 3/4 teaspoon fresh minced garlic and 1 teaspoon honey. Process until smooth and allow sitting in the refrigerator for a couple of hours so that flavors can meld. I cant find the recipe for your Crispy Baked Chicken Wings . I loooooooooove chicken wings. I can’t wait to try these recipes! Thanks Andrew! Love that they are crispy outside and tender inside!